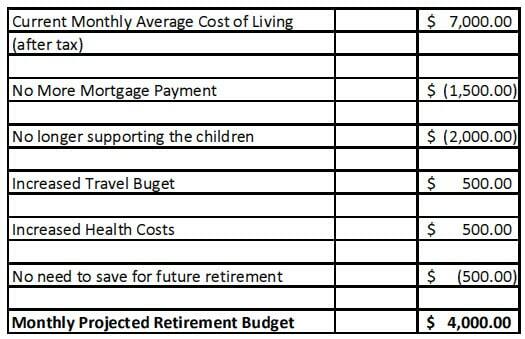 What Will It Cost You To Live Once You Retire? Do you know what it will cost you to live after you stop working? If you don’t know, you probably want to find out. It’s a crucial number. In fact, you can’t have a secure retirement unless you have a handle on this information Pilgrim. Accurately track what it costs you to live today. Make adjustments for lifestyle changes and inflation over your lifetime. Continue to monitor and adjust as the years pass. I admit that even if you do this you won’t know exactly how much it’s going to cost you to live in retirement. But this process will give you the best insight you can get into your future spending. That’s why it’s something you simply must do if you take retirement planning seriously. I’ve suggested this to readers so many times I’ve lost count. Tracking your current spending is simply a must. And don’t rely on your intuition. Most people underestimate their average monthly spending by 25% or more. That’s because they forget about the unusual and/or non-recurring costs that overtime tend to show up. These are items like repairs, maintenance, taxes, insurance etc. Don’t leave this up to guess work. Track your numbers Pilgrim. Fortunately you don’t have to become a bookkeeper or CPA in order to take of this. You can use a software package like YNAB or you can use my “5 Minute a Month” method to budget. Either option is fine as long as you track your spending. For awhile, you might travel quite a bit and then your travel could tapper off. Your mortgage might be paid off or you may sell your home and move into a rental. You hopefully won’t have to support your children. You’ll likely spend more money on health care. (According to the Bureau of Labor Statistics, the average person spends 25% more on health care during the first 10 years after age 65. You won’t have to save for retirement anymore. Your income taxes will probably be lower. In the example above, Jim currently spends $7,000 a month after tax. But his financial situation and retirement lifestyle are going to change a lot once he retires. As a matter of fact, it will only cost him $4,000 a month on average once he retires according to his projections. At this point, Jim knows a lot more than most people do about retirement but he’s not done yet. He still has to adjust for inflation. Again, this calculation is really easy to make. In the “Annual Interest Rate” input 3.2. According to Inflationdata.com, that is the average annual inflation rate from 1913 to 2014. 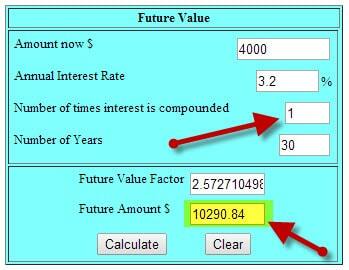 Put “1” in the “Number of times interest is compounded”. That reflects simple interest. Jim input 30 for the “Number of Years” because that’s how many years it will take before he retires. In this particular case, the outcome is 10290.84. That means, according to his calculations, Jim will spend about $10,000 a month (after tax) 30 years from now when he retires. That $10,000 will continue to go up with inflation for the rest of his life and he’ll have to invest accordingly. The greater the number of years that stand between you and retirement, the more important it is to monitor this process each year. Consider Jim. A lot can happen in 30 years. His entire lifestyle could change dramatically at any time and that will impact how much money he’ll need when he retires. That’s why he has to review this process every year or two or work with someone who can help him do so. The purpose of this exercise is to make sure you are on track to achieve your goals given the information on hand today. If you are on track, that’s fantastic. If not, it’s good to know now while you can still something about it. Let’s not put the horse before the cart. First, take these steps to get an estimate of what you’ll be spending once you retire. Have you made these calculations? Were you surprised by what you discovered? Did you make any changes as a result?